This ultimate treatment to target stubborn fatty deposits and prepare the action of slimming care. 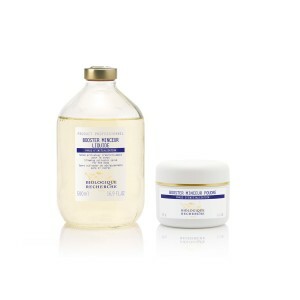 Biologique Recherche has developed a complementary two-product mix: Booster Minceur Liquid, with a high content of filtering and venotonic active ingredients, and Booster Minceur Powder, formulated with two enzymes, which, when activated, guide targeted active ingredients to the very heart of adipose tissue. Combined with stimulating massage techniques, this treatment programme is intended to oxygenate the skin, provide effective sculpting and increase the performance of specific products used. Skin Instants® with confined areas of accumulated fat. Toxin-eliminating, venotonic (enzyme-activating) and ionisable agents: Horsetail, Ivy and Nettle Extracts, Sodium Ions, Chloride Ions, Magnesium Ions and Calcium Ions, Ethoxydiglycol. Agents promoting the lipolysis (fat elimination) and the activity of hyaluronidase (elimination of excess water): Enzyme complex of Lipase and Hyaluronidase.